Back on June 29th, Snack Girl began healthy bread research WITHOUT government or industry funding. The experiment was simple. At the beginning of the experiment (see: Which Bread Is The Healthiest? ), I placed 3 slices of bread into Ziploc freezer bags and left them on my bookshelf at room temperature. The bread I tested was homemade bread, Wonder Bread, and Arnold 12 Grain bread. 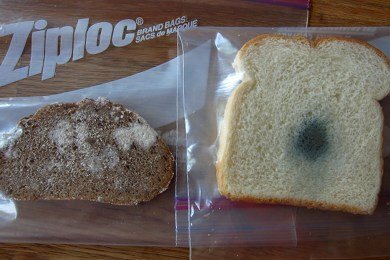 Each day, I checked to see if any visible mold, fungus, or bacteria had grown on the slices of bread. My hypothesis was that the homemade bread was going to mold first because it didn't have any preservatives. Other than that, I decided to let the bread speak for itself. The photos above and below were taken July 12th - 15 days after I started the test. Above the homemade bread is on the left and the Wonder bread is on the right. Do you see any mold? No? After 15 days at room temperature in a bag - NOTHING? Maybe the Arnold bread has more preservatives in it or, perhaps, it is made with SUPER grain that never rots (not likely). So, my homemade bread did mold before Wonder bread - if only a day before. But, it lasted 10 days before it molded which begs me to ask the question - do bread manufacturers really need to put preservatives into bread? I know you guys are going to get grumpy if I mention Whole Foods (since many of you don't live close to one), but I do buy some bread at Whole Foods. And, get this, their Whole Foods Organic Wheat Bread has ZERO preservatives and costs 28 cents less a loaf than the Arnold 12 grain. My guess is that Whole Foods bakes the bread in a central location and then HUSTLES it out to stores so that they don't need to add anything for freshness. Hey, if a slice of freshly baked bread can last 10 days in a bag at room temperature - how long can bread last that was made in a (I hope) much more sanitary kitchen? The bread product that will have zero preservatives will be bread that you can find in the freezer! This is a great option for those of us who want healthy bread and don't want to bake it. Check out the "Natural Foods" freezer part of your supermarket for bread that costs the same as many other commercial breads and doesn't have preservatives. Why do you think the Arnold bread hasn't molded after 15 days? Wow, that's interesting! Certainly making me re-think my bread choices at the grocery store! I was just saying to my husband last night how cheap it would be to make our own bread. Maybe it's time to start! The only bread I eat is Ezekiel. Most people recommend keeping it in the freezer (no preservatives), but I don't. And I purchase it at Trader Joe's because it's a lot cheaper there! And using the Cinnamon Raisin version you can make an incredibly delicious and healthy French Toast - not too many calories. 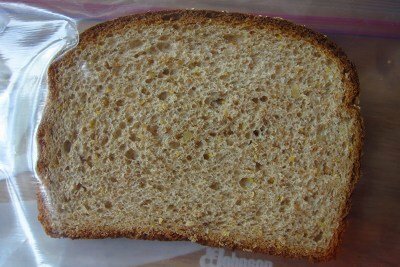 I have always loved white bread (Brownberry Country White was my favorite) and never really cared for wheat bread or any bread that seemed somewhat healthy for me. However, after reading through this blog, I have decided to change some of the unhealthy things that I eat. One of these changes includes my precious white bread. I went to the freezer aisle of my local Pick n Save and decided to try Rudi's Organic Honey Whole Wheat bread. I've only eaten it for the last few days, but I'm surprised and delighted with how great it tastes! Yay! One step closer to a healthy lifestyle! I am interested in finding out what is the different between white growth and blue growth. I bake lots of different kind of bread at home, even hamburger and hot dog buns, all of it so much better than mass produced baked goods. The Arnold bread scares me even more than the moldy breads. Umm, well, now I'm really hating the fact that I've been buying Arnold breads - the Thins for the adults & the whole grain wheat for the kids - for a while now from Sams since it was so affordable & somewhat "healthy". The fact that it isn't molding at room temp in a sealed bag...is concerning. Real food goes bad. Fake food lives on & on. Sigh, I need to rethink my bread choices. Darn it. Darn it. Darn it. darn! I always get those Arnold Thin rolls...need to find another at Stop & Shop - any ideas? I keep all my bread in the freezer until I'm ready to use it. Guess I don't need to. I simply stopped buying and eating bread. This way, there's no need to try and guess what's in it or how long it will keep. My "breadless" life suits me just fine. Microbial and mold growth is dependant on the food source, moisture and the environment. It may not be the amount of preservatives in the Arnold bread that is affecting the mold growth but the amount of water used when making it. Perhaps the amount of water in the other two breads is greater than that of the Arnold bread and that is what triggered sporulation. Danielle, I think you are on to something. There are a lot of things that could affect when the bread molds in addition to the preservatives present in the bread. Lisa, I am not sure whether your test really addresses your question of "Which bread is the healthiest?" I think looking at the ingredients would be a better test for that question. You only really addressed the question of which bread molds the fastest, which is interesting and would certainly contribute to my choice of bread, but maybe not in the direction you are hoping. I know you know about how to test scientific hypotheses (since we learned the same place! ), so I am not sure why you went with this as a test of healthiness. I love your blog though and think it is a wonderfully worthwhile endeavor! @Shanna - hey, girl! My assumption - which I realize now is not explicit - is that the more microbes that exist - the healthier the food. As you know, we have gut microbes that interact with food microbes and a LACK of food microbes has been attributed to an inability to digest food. I guess what I am really testing here is "Will microbes eat it?" and that is not necessarily a test for healthiness. It is more an attribute that can contribute to healthiness. Interesting, though, isn't it? I'm all about Ezekiel bread. I agree with Ken above - it's cheaper at Trader Joe's so that's where I tend to buy it. I buy several at a time for home & work. Keeps well in fridge & freezer. The cinnamon raisin is the BEST! I buy my bread from Great Harvest. No preservatives and all natural ingredients. But the Whole Foods brand sounds great too! What's the white stuff on the Arnold bread? looks like mold to me. @Michelle: I think it's just the Ziploc bag, looks like it. That's such a great idea! Look in the freezer section! I try to avoid it though >.< ice cream takes up half of the freezer section at where I got to. I'm going to have to go look there, thanks Snack-Girl~! i've all but given up bread, but if i do, then the really heavy german style rye bread is amazing. so filling, flavoursome and nutritious. great with cheese or peanut butter. Currently, we buy local bread at $5.50/loaf from Whole Foods. It lasts 4-9 days without molding. We love the bread we buy and tried many before buying it regularly; however, I'd like to make our own. I'm going to test a couple of recipes in my Mum's bread maker and, if they turn out well, buy one of our own. What recommendations do you all have for a good bread maker? Out budget is 70-200 USD. The white stuff is probably Rhizopus and the green is probably a Penicillium species. Both are common bread molds and can also be opportunistic pathogens. Neither is likely to hurt you unless you are immunocompromised or allergic.